Storage :Lyophilized CJC-1295 W/ DAC is stable at room temperature for 90 days,however it should be stored in a freezer below -8C for any extended period of time. After reconstituting CJC-1295 W/ DAC should be refrigerated at temperatures not to exceed 36 F.
CJC-1295 is a derivative of human GH-releasing factor1-29(HGRF1-29). 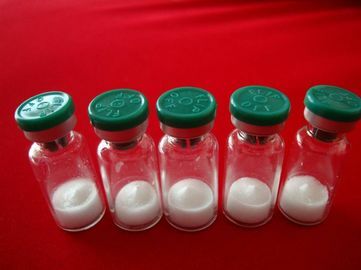 HGRF1-29 is a naturally occurring peptide that is actually a truncated form of a larger peptide that binds to the growth hormone secretagogue receptor (GHS-R) and causes the release of growth hormone. CJC-1295 has four amino acids substituted in its chain that result in strong binding to serum albumin and prolong its half-life in the body. Because of the way CJC-1295 is engineered its half life has been extended from ~7 minutes to greater than 7 days!. This is convenient as it means the product only needs to be injected 1-2 times per week for continuously elevated levels of Human Growth Hormone (HGH) and IGF-1. A single subcutaneous (sc) injection results in measurable quantities of CJC-1295 in the blood for up to 13 days. Additionally, a single dose of 60 ug/kg of CJC-1295 results in elevated levels of growth hormone (125%) while the pulsatile secretion of GH is maintained. Furthermore, 60 ug/kg of CJC-1295 elevated IGF-1 levels to the upper limit of normal. A dose of 30 ug/kg of CJC-1295 given weekly maintained its response with no evidence of desensitization. The advantage of using CJC-1295 instead of actual HGH injections is that injecting HGH shuts down the body's own natural production and therefore when injections are ceased, the body’s ability to produce it's own HGH may be impaired and take some time to recover. Since CJC-1295 only stimulates the body's own HGH production, this risk is not apparent. Clinical Research was first conducted for CJC-1295 during the mid-2000s. The objective of the peptide was to treat visceral fat deposits in obese AIDS patients, as increased levels of exogenous hgH are presumed to increase lipolysis (fat loss). The clinical research was ultimately successful for most research subjects. Those looking for anti-aging benefits, improved physique and sense of well being. Administration of single doses of CJC-1295 resulted in a 2- to 10-fold increase in mean serum GH levels in all dosing groups, which was dose incremental and persisted for up to 6 days. Similarly, a dose-related increase in mean serum IGF-I levels was observed at all dose levels, ranging from 1.5- to 3-fold and persisting for up to 14 days. Administration of ascending multiple doses of CJC-1295 resulted in elevated levels of GH, similar to those observed after a single dose. In contrast, elevations in IGF-I levels showed a progressive effect over time, particularly in subjects receiving CJC-1295 every 7 d. Results of the multiple-dose study suggest both a cumulative pharmacokinetic effect [i.e. persistence of elevated predose levels of IGF-I in all dosing groups except group 1 (i.e. two injections of 30 µg/kg)] and a pituitary priming effect (i.e.progressively greater Cmax and progressively shorter Tmax after serial dosing). The data indicate that a minimum dosing interval of 7 d appears reasonable. The most appropriate dosing interval will be determined based on actual efficacy and safety data from longer-term therapeutic studies in patients with various clinical conditions. No serious adverse reactions were reported in either study. The most frequently reported adverse events in subjects receivingCJC-1295 were injection site reactions, consisting of transient pain, swelling, and induration that were sometimes accompanied by local urticaria. Injection site reactions tended to be more severe and/or prolonged at higher dose levels. Headache, diarrhea, and flushing were also observed, with occasional transient and mild hypotension, but occurred primarily at higher doses. Adverse effects complicate the use of GH in the treatment of HIV-associated metabolic conditions such as wasting and lipodystrophy. Although increases in the daily dose of GH from 1 to 6 mg are associated with dose-responsive benefits, doses of 2–3 mg/d or greater are associated with edema, arthralgias, and glucose intolerance. These side effects can become dose limiting. In the current studies, none of the subjects experienced these adverse effects. Future clinical trials on this disorder will confirm whether the use of GHRH rather than GH will circumvent these problems, as has been suggested in recent publications. In summary, a single sc administration of CJC-1295 produced sustained elevations of serum GH and IGF-I levels in normal subjects for nearly 2 wk. Weekly or biweekly administration of CJC-1295 resulted in stimulation of GH and IGF-I secretion for at least 7 d. Both single and multiple doses of CJC-1295 over 2 wk were safe and generally well tolerated, particularly at doses of 30 and 60 µg/kg. Future studies are indicated to evaluate the clinical utility of treatment with CJC-1295 in patients with intact GH secretory capacity. Now for any GH releaser’s benefits to reach full potential, somatostatin has to be controlled because it will inhibit gh release. Using an agent known as an Acetylcholinesterase inhibitor will allow acetyl chlorine levels to rise by preventing acethylcholineesterase from overriding acetylcholine; acetylcholine will inhibit somastostatin production. An example of a natural acetylcholinieestarase would be Huzperine A. A recommended dosage for HuzperineA would be around 50mcg. Now as mentioned before a more potent pharm grade somastostatin inhibitor would be Ipamorelin. Logically speaking it would make PERFECT sense to combine CJC-1295 with Ipamorelin since you get the increase in GH from CJC and the increase of GH pulse frequencies with a reduction in somatostatin from the Ipamorelin. This leads to a maximal GH release effect, thus allowing for maximum anabolism from optimized GH without desensitization.